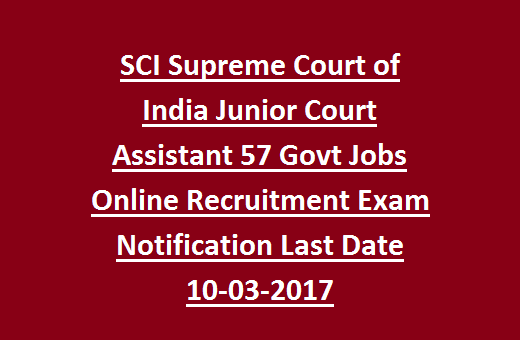 Indian Supreme Court recruitment 2017. Interested candidates having eligibility conditions can apply for these Junior Court Assistant vacancies through Supreme Court of India official website @ www.sci.nivc.in. Selection for this latest SCI Junior Court Assistant Jobs will be based on written/ Typing/ Computer Tests and Interview. Last date for online registrations for Jr Court Assistant Jobs is 10- March- 2017. For more details regarding Educational Qualifications, Age limits, pay scale, Selection process, Written Test and Exam Pattern, Syllabus, How to apply online for Indian Supreme Court SCI Junior Court Assistant Jobs recruitment exam 2017 are given below. Click here to see the official notification of Junior Court Assistant Indian Supreme Court Jobs Recruitment. Starting date to register online applications: 11- 02- 2017. Last date to submit online applications: 10- 03- 2017. 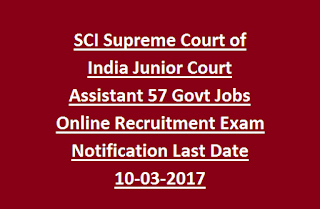 There are total 57 Junior Court Assistant posts are going to fill through this Indian Supreme Court SCI Recruitment 2017. Post Name: Junior Court Assistant (Group B, Non Gazetted): 57 posts. The no of vacancies are tentative. Candidate must have qualified Bachelor’s Degree from a recognized University and must have knowledge of Computer operation. Must have typing speed of 35 wpm in English on computer. Monthly Pay scale for the current recruitment is Rs.35,400/- with Grade pay Rs.4200/-. Candidate Age limit for General candidate should be 18 years to 27 years as on 01- December- 2017. Upper age relaxation for SC/ ST/ OBC/ Ex Serviceman is as per Govt rules. Selection for this SCI Jr Assistant Jobs will be based on written test/ Typing test/ computer test and Interview. Candidates having eligibility criteria have to appear for the following tests. 1. Supreme Court of India Junior Court Assistant Written test Pattern: Written Exam will be conducted for 200 marks, consists of 100 questions (Objective Type Question Paper with Multiple choice answers) in 2 hrs duration. 2. Computer Knowledge test (objective type): which consists of 25 questions of 2hrs duration. 4. Descriptive (English) test: Consists of Comprehension passage, Essay writing, Precis writing in 2hrs. Candidates who have qualified all these test will be required to appear for an Interview. SCI Junior Court Asst Jobs Application fee for general and OBC candidates is Rs. 300/-, for SC/ ST/ Ex serviceman/ PH candidates is Rs. 150/- plus bank charges. Fee payment should be online mode only. Candidates fulfilling eligibility conditions can apply online through Indian Supreme Court website @ www.sci.nivc.in. After successful completion of application form, keep the application number for generation of admit card/ call letter. Candidate is required to upload photograph 5cm height & 3.8 cm width and Signature along with application form. Online registration starts from 11- February- 2017 to 10- March- 2017.